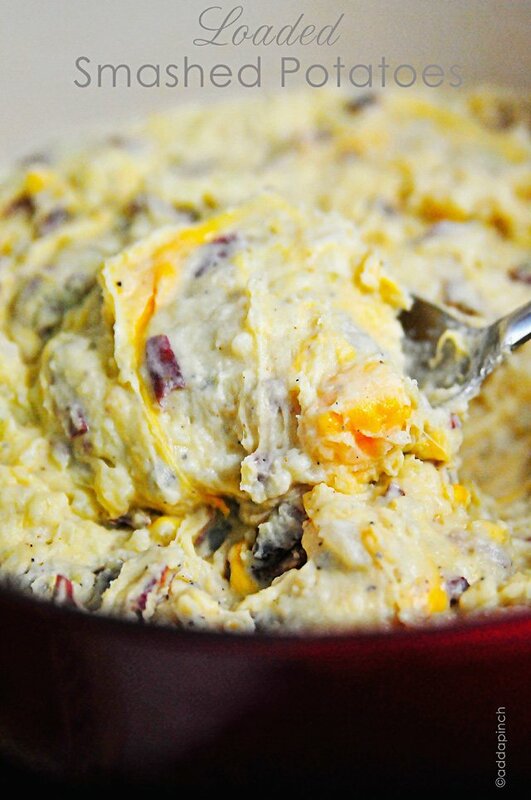 Loaded Smashed Potatoes make a perfect side dish. This easy recipe for loaded smashed potatoes is great for entertaining and comforting family meals. 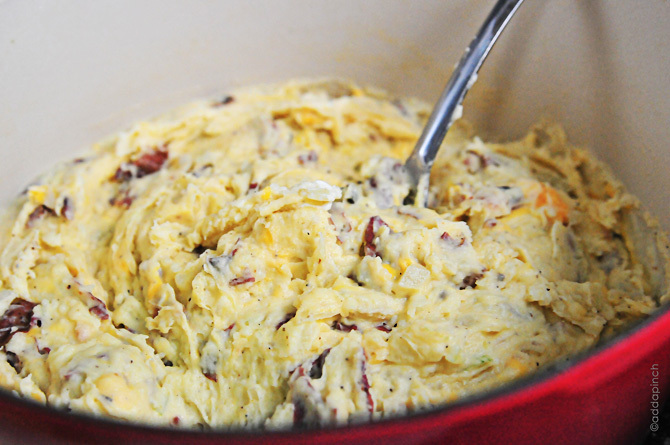 Loaded Smashed Potatoes have to be one of my favorite side dishes to make. Like ever. 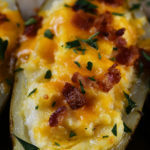 Full of everything you love about a baked potatoes, these loaded smashed potatoes are even better, in my opinion. They are so easy to prepare and work well for serving a crowd for special occasions, when entertaining, or just because. 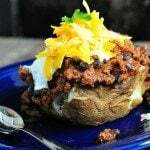 Here’s the recipe for my Loaded Smashed Potatoes. I seriously can’t wait to hear how you love them! Loaded Smashed Potatoes make a perfect side dish. Great for entertaining! In a medium saucepan, melt butter, add half and half and roasted garlic. Heat until simmering. Drain potatoes and pour potatoes back into saucepan used to cook them. Smash potatoes over low heat until chunks of potatoes remain, but the majority of the potatoes are smooth. Add the melted butter and half and half mixture to potatoes. 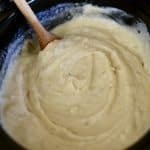 Continue to mash the potatoes to incorporate the half and half mixture. 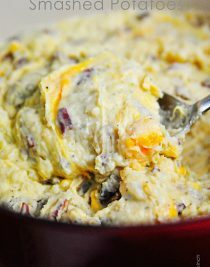 Then, mix in garlic, sour cream, bacon crumbles, and cheddar cheese with a spoon until well-combined. Stir in salt and pepper. Pour potatoes into a serving bowl for serving. Make-Ahead Tip: Prepare mashed potatoes and pour into a casserole dish. Cover tightly with aluminum foil or a lid and refrigerate until about 20 minutes before ready to serve. Then, place in a preheated oven at 350º F for 20 minutes. When you remove from the oven, top with remaining 2 tablespoons of butter and a sprinkle of salt and pepper, if desired. OH.MY Seriously those look like the best mashed potatoes EVER. LIKE EVER! Thanks! They are seriously scrumptious. Not fair! I could eat this for every single meal. But I need salad. Gosh, these look good! I know, I know. BUT – they aren’t for today. Just sometime. Wow, these sound delicious! I can’t wait to try these! Bacon, cheese, what is not to love. Whoa, these look like the best thing ever! Ultimate comfort food? I think so. I can’t wait to try these potatoes, yummy! This dish could seriously be my breakfast, lunch, and supper! Yum! Good gravy, those look yummilicious! What’s NOT to love about them?! I think I just found my lunch! There’s is nothing here that I don’t love. Woah! 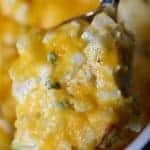 Best smashed potatoes ever! Lovely, just lovely! I know Curtis would love this so much too! Your post made me laugh Robyn! I could seriously dig into these – soon! 🙂 They look amazing, absolutely amazing. Loaded is right, oh my these look good! This really just makes me want to run into my kitchen NOW and make them – and I literally just ate dinner! These look AMAZING! Oh my my! These look so awesome! Wow we’re on the same wavelength with the loaded potatoes! Yours look great! 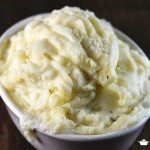 Who could say no to these mashed potatoes loaded with butter, cheese and garlic! I Want Some Right Now!! Put whole potatoes in cold water and cook for 15-20 min?? It seems like it would take a lot longer. Am I reading it wrong? Happy Easter, and thanks for a great Easter recipe! This may be a new tradition! These turned out delicious! Easy and a true star at any dinner! 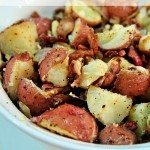 I didn’t have red potatoes, but I just left some skin on the white ones, and they were still wonderful!